Garlic Parmesan Roasted Carrots are the perfect addition to your Easy Easter Side Dishes! Whole, peeled carrots are seasoned simply with salt, pepper, and oregano, drizzled with a little garlic oil, and roasted whole until tender. Finish with a sprinkling of freshly grated Parmesan and melted butter for an easy and delicious springtime side. 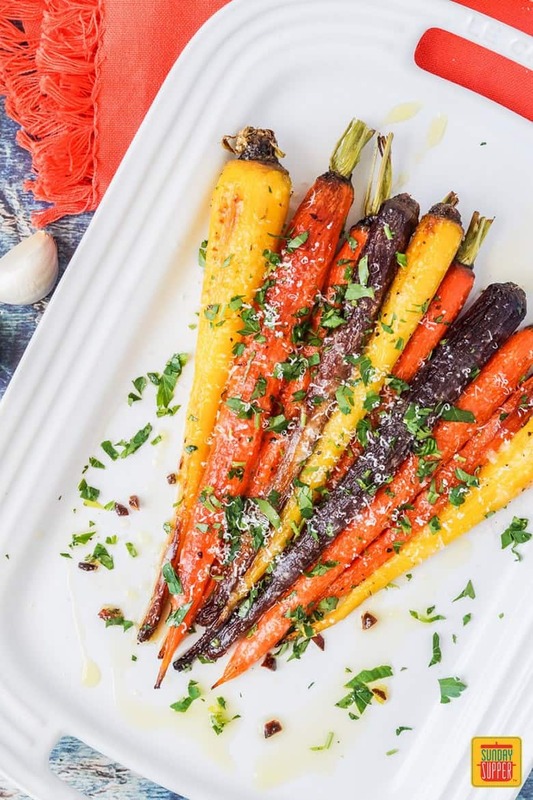 With the help of the oven and a handful of ingredients, these Garlic Parmesan Roasted Carrots transform into a wonderfully tender and flavorful side dish perfect for your Easter or springtime table. Roasted whole carrots make a nice presentation and are a fun way for the kids to eat them, especially if they aren’t a fan of raw carrots. They’ll have no problem finishing off these naturally sweet roasted whole carrots. I used a variety of orange, yellow, and purple for a rainbow of colors. 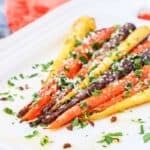 This beautiful dish of whole roasted rainbow carrots makes an impressive Easter side dish on your holiday table. I arranged the carrots in a single layer on a rimmed baking dish and drizzled the fragrant garlic oil evenly over them. After seasoning with salt, pepper, and oregano, I roasted the whole carrots in the oven on one side for about 15 minutes before flipping them, topping with the Parmesan, and continuing to roast until fully tender. They are best warm from the oven with an extra drizzle of melted butter, more Parmesan, and a little sprinkling of freshly chopped parsley. This recipe serves 2-4, but the ingredients can easily be doubled or even tripled for a crowd. Don’t allow the garlic to brown when warming with the olive oil. You should heat the mixture just enough to become fragrant. The garlic will darken as it cooks in the oven. Crush the dried oregano between your fingers before sprinkling over the carrots. This will help release additional flavor. The roasting time may vary a little based on the size of your carrots. It takes 25-30 minutes for small to medium carrots. Add a few more minutes for those that are larger. If desired, you can cut the carrots into slices or strips before roasting. Cook in a single layer and they won’t need as long to become tender. Start checking them about 10 minutes earlier than you would for the whole carrots. Use tongs to easily, but gently, flip the carrots. For easy cleanup, line the baking sheet with parchment paper. Want to avoid butter? 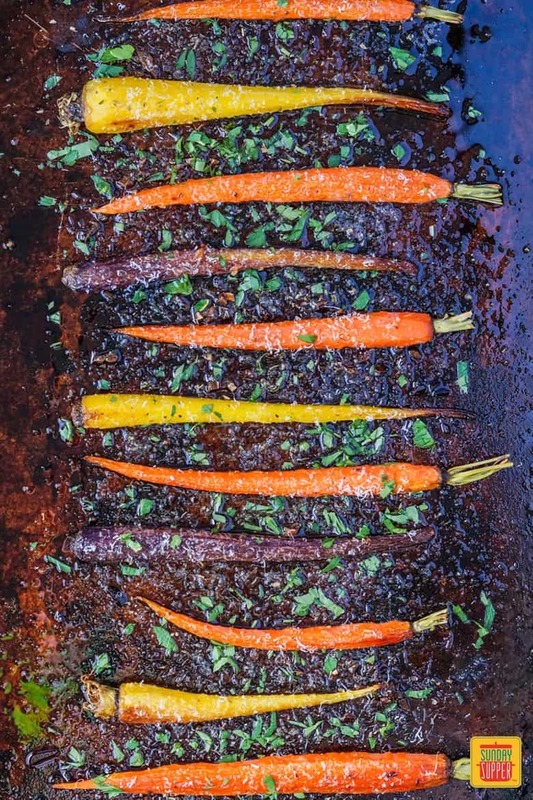 Finish the carrots with an extra drizzle of olive oil instead. It will help the Parmesan and parsley stick to the sides. Looking for more Easy Easter Side Dishes? Try Gluten Free Au Gratin Potatoes, Strawberry Easter Treats, Radish Chive Tea Sandwiches, and Lemon Posset. 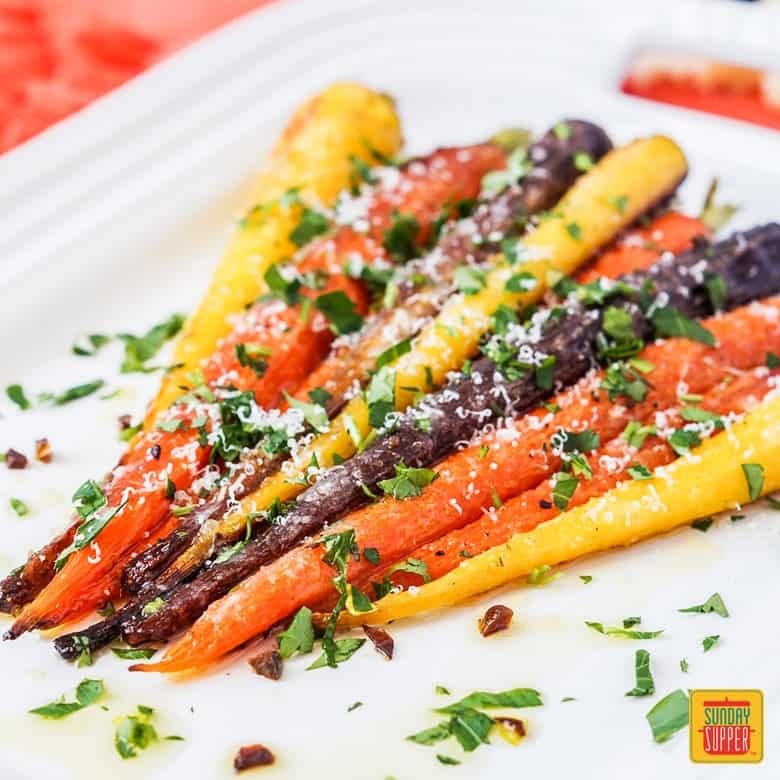 These Garlic Parmesan Roasted Carrots are the perfect addition to your Easy Easter Side Dishes! Whole, peeled carrots are seasoned simply with salt, pepper, and oregano, drizzled with a little garlic oil, and roasted until tender. Finish with a sprinkling of freshly grated Parmesan and melted butter for an easy and delicious springtime side. In a small saucepan, combine the olive oil and garlic over medium heat. Cook just until the garlic is fragrant, about 1 minute. Remove from heat. Arrange the peeled carrots on the prepared baking sheet in a single layer. Evenly drizzle with the garlic oil. Sprinkle with salt, pepper, and the oregano. Roast in preheated oven for 15 minutes. Flip the carrots over, sprinkle with Parmesan and cook for another 10-15 minutes or until the carrots are tender. Drizzle the melted butter over the carrots and top with parsley. If desired, add a little more salt, pepper, and Parmesan. Serve immediately.